Many values for initspeed and airfriction were changed to unrealistic and nonsensical values. initSpeed changed to 860 from 820, airfriction changed to -0.00018 from -0.001006. The new initspeed/typicalspeed is okay (nominal muzzle velocity in 22" test barrel is approximately 853 m/s), but the new airFriction is ridiculous. The standard 143-149 grain FMJ bullets have a G7 ballistic coefficient of approximately 0.200. At initSpeed of about 853 m/s this requires an airFriction of approximately -0.001. The old value was correct. The new value of -0.00018 results in a G7 BC of approximately 1.00, that is five times higher than realistic. initSpeed changed to 960 m/s from 884, airFriction changed to -0.00024 from -0.00129. The old value of 884 m/s was correct for the M4A1 using M855 ammunition, however it became outdated when various other 5.56 weapons were added. The new initSpeed/typicalSpeed could be correct for certain weapons and ammo but is on the high side. For example, it's appropriate for the US Army's high-pressure M855A1 from a standard 20" barrel, but there are multiple countries or sources of weapons represented in the game and the M855A1 was not adopted until late 2017 anyways, so regular green tip M855/SS109 is a better choice. SS109 should have initSpeed/typicalSpeed of 940 m/s. That's a very typical velocity from a standard 20" barrel. The new airFriction -0.00024 is ridiculous. It's about 5 times too low! The 62 grain SS109-type projectiles have a G7 balllistic coefficient of approximately 0.155-0.160. To represent this in DayZ, you need an airFriction of at least -0.0012. I only gave examples of two projectile types that have the wrong values applied, but right now, not even a single projectile has an appropriate airFriction. -buckshot has airFriction -0.05 and init/typicalSpeed 350. The extremely high airFriction results in a max range (pointing gun up in air) of about 75 m! In real life, size "00" buckshot pellets travel over 600 m. A correct airFriction calculated from spherical drag model is -0.008, and a correct nominal muzzle velocity is 404 m/s for several brands of buckshot (although velocity could realistically be between 360-405 m/s). 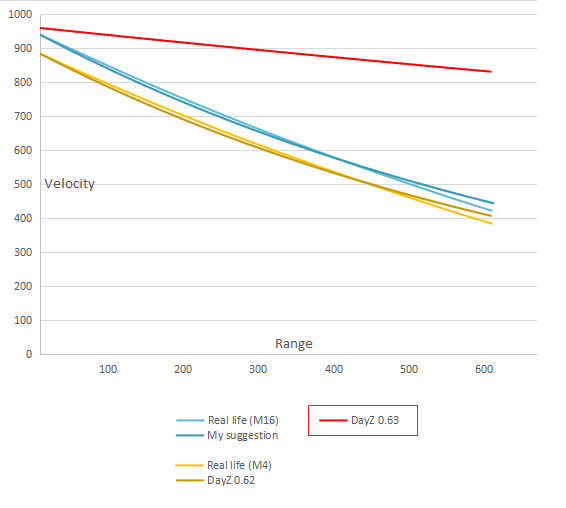 With DayZ simplified ballistics it won't result in the real-life 600+m range, but it will give relatively correct speeds at the effective range, which is really what is most important (who points the gun into the sky and shoots buckshot at 600 m?) Buckshot also has only 8 pellets, which matches the box artwork, but most full-power 00 buckshot contains a standard 9 pellets. -5.45x39mm has airFriction -0.00027 and init/typicalSpeed 880. The 880 m/s is the velocity at 25 m from a test barrel fixture. From the muzzle of the weapon it should be a nominal 900 m/s, or perhaps higher. The airFriction is again several times too low. Appropriate airFriction for older 7N6-type rounds is -0.00125, calculated from various sources including Soviet tables. For the newer 7N10 it's -0.00117. -.357 Magnum has an airFriction of -0.000599 and initspeed of 440. I guess initspeed is based on a lighter 125 grain bullet used for personal defence. For the Colt Python and repeater the heavier 158 grain (10,24 g) bullets makes the most sense. The airFriction is much too low. As it enters the transonic range shortly after firing, this round requires a high airFriction to match real life downrange ballistics. However, the .357 gains a great amount of speed in the rifle barrel, meaning there is a large difference between appropriate airFriction/velocity values for the revolver and the rifle. A compromise value of 445 m/s can be appropriate for certain types of 158 grain ammunition from the rifle, and appropriate for lighter bullets from the revolver. In addition a compromise airFriction of approximately -0.0026 could also be appropriate for both light bullet from revolver, and a heavier bullet from the rifle. To have ideal values for each you would need not only separate velocity, but separate airFriction for revolver/rifle. Hello Gews and thank you for the report.